Filmed over five years in 25 countries, SAMSARA is a new, non-verbal documentary from filmmakers Ron Fricke and Mark Magidson (who first brought us BARAKA). Samsara is a Sanskrit word that means “the ever turning wheel of life”. The filmmakers use this theme as they search for what connects everything in our lives. What we see sometimes amuses, sometimes inspires, and sometimes makes us cringe. 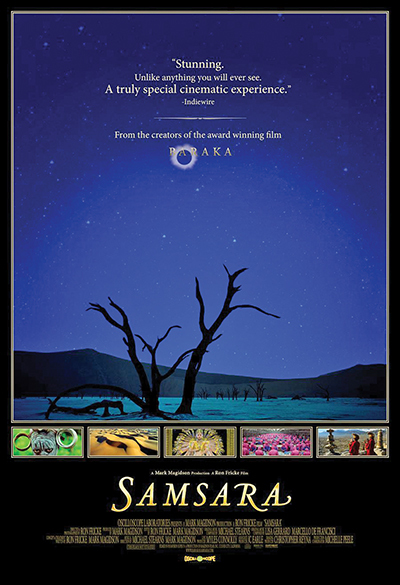 There is no plot to SAMSARA – it doesn’t need one. Just sit back and let it immerse you in what some have even described as a “guided meditation”. For two hours, audiences are mesmerized by the film’s layered narrative of juxtaposition, cause and effect, and wonderment. We see earth and its people at their best and sometimes worst, in stunning clarity. You’ll see landscapes, people and time-lapsed sequences with subjects such as sacred grounds, sites of disasters, industrialized zones and natural wonders, monks creating a mandala and the wreckage of houses after Hurricane Katrina. We also watch the testing of lifelike robots alongside humans, group exercises in a prison, garbage pickers in a mountain of trash and pilgrims circling a tomb. There are some underlying themes for the film makers: the need for recycling, the manufacturing of weapons, the extent the world has to stretch to feed its people, as well as Buddhist themes of circularity and renewal. Beauty is in nature and ugly is created when man tries too hard. However the film is described or analyzed, everyone agrees it’s worth the experience. It took 19 years to make. Fricke and his crew lugged Panavision cameras across five continents. It is one of only a handful of films shot on 70mm in the past forty years. This is a wide high-resolution film gauge that most cinemas actually cannot handle 2001: A Space Odyssey (1969), for example, also was shot on the same Panavision Super 70mm film. fusion music band Dead Can Dance, and the film’s producer.